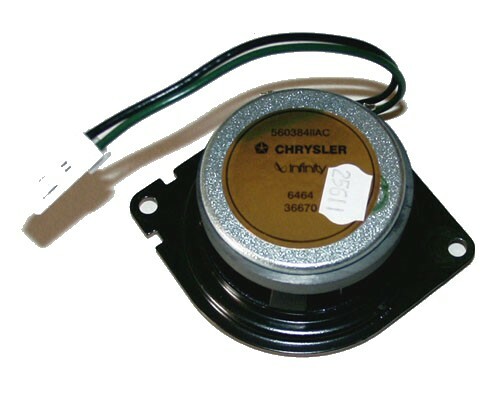 WJ Grand Cherokee Tweeter for the 1999-2004 Grand Cherokee. OEM Infinity tweeters. Hard to find size. Replaced the two front tweeters on my 2000 Grand Cherokee that has the Infinity system - the original ones were blown. Considered using aftermarket tweeters that would have cost less, but this is a unique size and mounting system so it wasn't worth the savings to come up with a retrofit. Installed in 30 minutes - plug and play. Nice sound! Pros30 Minutes to install two units. ConsPricy, just like all OEM parts. Now they are on sale for $5 cheaper! These are Mopar items. The tweeters in my 2002 GC Overland were blown (terrible static coming from them). These factory replacements made the factory stereo system sound great once again. ProsEasy to replace (about 10 minutes) and no special tools.